Chattanooga's new Chamber of Commerce CEO Christy Gillenwater answers questions from the media Wednesday on her first day on the job. Christy Gillenwater says she knows firsthand the challenges facing small business people. Her husband is an entrepreneur in the real estate sector, including owning a couple of Salsarita's Mexican restaurants in Kentucky and Indiana, said the new Chattanooga Area Chamber of Commerce chief executive on Wednesday. "I can appreciate the small business story," she said. "I hear it firsthand at home." 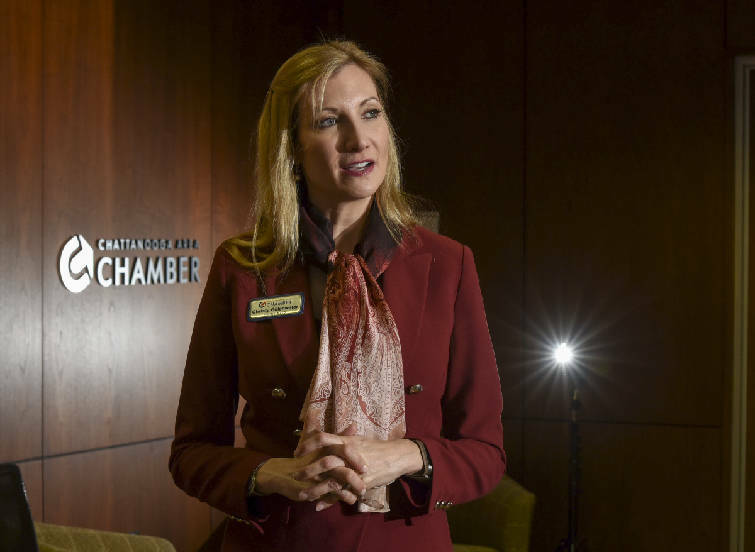 Gillenwater, 43, hit the ground running on her first day on the job in Chattanooga, taking part in a board meeting for the business group that has nearly 2,000 members and oversees Hamilton County's economic development efforts. 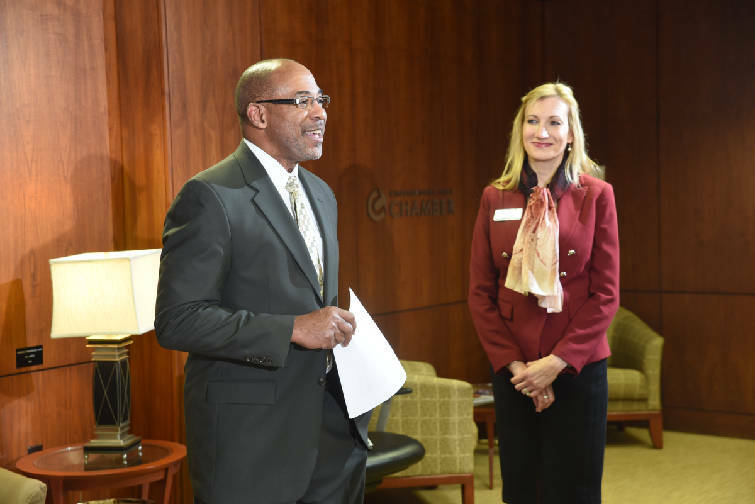 Larry Buie, left, Chairman of the Chattanooga Area Chamber of Commerce, introduces new Chamber CEO Christy Gillenwater to the media Wednesday. She brings a wealth of experience with chamber organizations. She was hired away from an award-winning chamber in Evansville, Ind., where she was its president. Gillenwater also served eight years as CEO of the Greater Bloomington Chamber. In all, she has 21 years working for chambers of commerce in Indiana. Earlier this year, Gillenwater was named Chamber Executive for 2017 in Indiana. 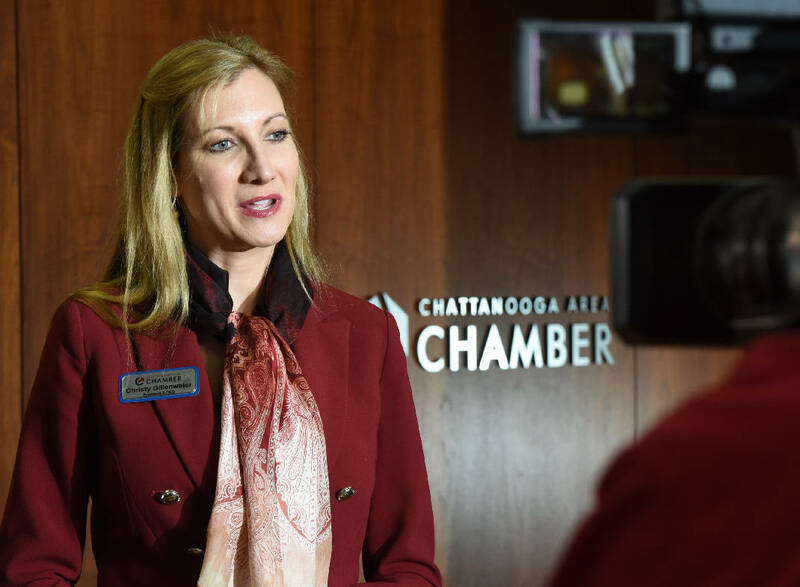 As Chattanooga Chamber chief, she replaces Bill Kilbride, a former Mohawk Industries executive who held the job for three years. The past three Chamber CEOs came to the group after serving as executives with local companies. "Every leader is different," Gillenwater said. "Hopefully, my tenure is what Chattanooga and the Chamber needs." Her aim, she said, is to continue to drive forward in the areas identified during Kilbride's time, such as workforce development, diversity and inclusion, public policy and meeting member needs. But, the new CEO said, she'll also be open to other opportunities. One of her strengths, she said, is that she has a lot of national connections with other chamber executives. "You can learn things from other regions or parts of the country," said Gillenwater. "Who's the best of the best in this space. I bring a strong depth and breadth of contacts." Also, she said, she'll work on building and strengthening "a dynamic team" at the Chamber. "I love to build a team," Gillenwater said, who is a graduate of Indiana University and earned her MBA at Ball State University. In addition, she'll serve as the first female CEO of the 130-year-old Chattanooga business entity. "In our industry, we're seeing more females leading chambers," Gillenwater said, adding that "the right person at the right time in that position is the one chosen." Larry Buie, the Chamber's chairman, said he's "very pleased" with the hiring of Gillenwater for the CEO's job and with her experience. "She's the next leader to help us get to the next level. We have a very seasoned individual who's bringing a lot of value to the area," he said. Buie declined to say how much Gillenwater will earn at the Chamber. According to IRS filings for the nonprofit group in fiscal 2015 — the most recent year for which full figures were immediately available — Kilbride was paid $222,755 in compensation from both the Chattanooga Chamber and its affiliated Chamber Foundation. Sybil Topel, vice president of marketing and communications for Chattanooga Area Chamber of Commerce, said the compensation for Gillenwater "is commensurate with the rate of pay for Chamber executives and is aligned with others in similar positions in similar-sized regions. "Building dynamic communities is extremely competitive," Topel said.